The Marblehead Racing Association (MRA) is a volunteer organization that is comprised of the Race Committee Chairs as well as designated representatives from the Boston, Corinthian and Eastern Yacht Clubs. The MRA is responsible for scheduling and coordinating both one-design and PHRF racing for each season. The MRA committee fosters the long-standing relationship between the race committees of the three major clubs in Marblehead Harbor. Members of the committee work with the representatives of each one-design fleet and with other Mass Bay PHRF members. The result of this effort is the coordinated schedule of races, as well as the Notice of Race and Sailing Instructions for each event, and the requisite permits for all these activities. 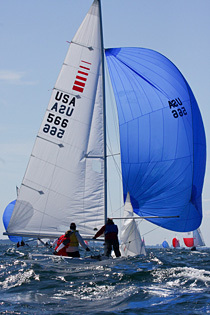 The MRA has also established safety procedures for on the water emergencies, set up judge and race management seminars for both its own constituency and for others in the Northeast Region, and conducted seminars on tactics and rules for those who participate in sailboat racing in Marblehead and Salem Bay. MRA provides the race management liaison with NOOD, scores both large and small events as well as the overall racing season, and then awards trophies to those who succeed on the racecourse. We are committed to ensuring that Marblehead continues to be one of the world's premier yacht racing venues. As such, we look forward to working with you to continuously improve the quality of Marblehead racing, while at the same time ensuring fun and safety for all competitors.